Kerman’s research included nuclear and high-energy physics, astrophysics, and the development of advanced particle detectors. His interests in theoretical nuclear physics included nuclear quantum chromodynamics-relativistic heavy-ion physics, nuclear reactions, and laser accelerators. He developed a set of nucleon-nucleon potentials, which were found to be useful for the study of nuclear matter and finite nuclei. Professor Kerman, a native of Montreal and a graduate of McGill University, joined the MIT faculty in 1956 as an assistant professor of physics shortly after he received the PhD from MIT. 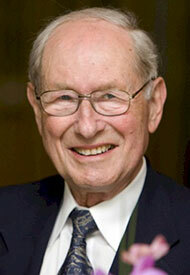 He became an associate professor in 1960 and professor in 1964. From 1976-83, Professor Kerman was director of the Center for Theoretical Physics. From 1983-92, he served as director of the Laboratory for Nuclear Science. Professor Kerman was made a fellow of the American Physical Society, the American Academy of Arts and Sciences, and the New York Academy of Sciences; he was named a Guggenheim Fellow in Natural Sciences. He was associate editor of Reviews of Modern Physics.